“But at the same time, there is definitely a lack of outlets for foreign players to shine and rank themselves amongst one another with a monetary prize-finish at the end. The suggestion of regional-prized tournaments ranging from different levels helps alleviate the frustrations for many players and connect them back with challengers they can build off from one another. 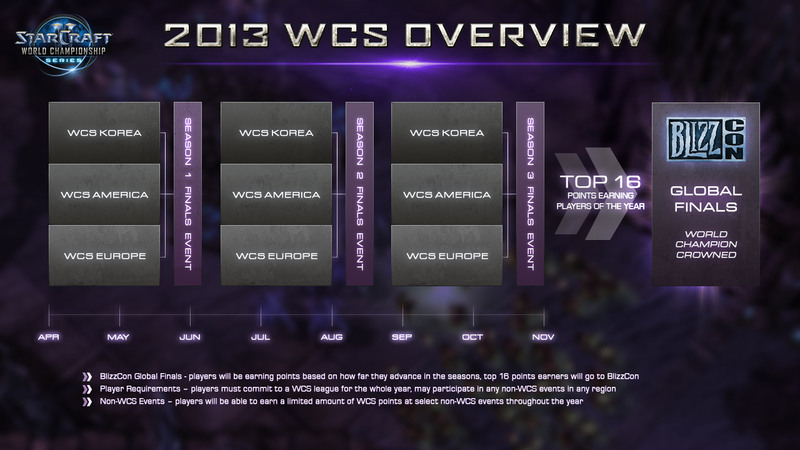 Indeed, as explained in the 2013 WCS overview, this system not only creates a proper boundary schedule for any person’s career (between April and November), it also allows for tournament organizations to properly line up their event for equal distribution of fan-interest as well as high-player attendance (both from the reputable players to the aspiring ones). Creates an even schedule of multiple seasons, allowing for proper budgetary planning and scheduling for players and teams (I expect contracts to be drawn up less annually and more every two seasons, especially with newer recruits). Easy system to rank players regionally and worldwide to know who really is the best not through number of achievements, but through consistent performance and ranked points. Allows the possibility of new champions rising and recycles those who longer are ahead of the curve. NASL (NA), DreamHack (EU) and Proleague (KeSPA) [KR] will likely be part of the scoop of points attributed to WCS rankings and seeds, it also means they are considered second-class events due to their less impactful effect on a WCS season. This point-system also means that any other tournament organizations looking to get involved in StarCraft II will have a steeper climb to reach relevancy. Events that are not associated with WCS nor receiving points to attribute to WCS seedings will have to fit their events within the championship series (and also create a reason why people should watch it). As stated, the drawbacks are minor given the downward slope in terms of number of new tournaments and competitions being created. The online portion of WCS will also attract cheaters and potential hackers, but that is something that is both inevitable and small in exchange for convenience and widening the ability to attract as many new competitors as possible. The truth of it all is that Blizzard’s World Championship Series is a step in the right direction, few disagree, many don’t agree with some of the smaller issues such as the pseudo-region lock. Such as ways to bypass the system in which Koreans will be in North American system knowing they are not up to snuff to prevail in the GSL/OSL and Proleague. The point system can also be trouble if improperly balanced where we may see another Pool Play issue (players who have not been succeeding, continue to maintain seedings and points due to their achievement many months ago). In short, the faults and issues with the World Championship Series are both minor and hastening the process that was occurring already, the upside to it all is that the prize-money is elevated, the opportunity to compete is less costly and stories are created. With Blizzard’s WCS, the foundation of competition is elevated and the next step for StarCraft II has begun!